Windows 10 Start Menu has so far received mixed reviews, some say it’s awesome, and others hate it. 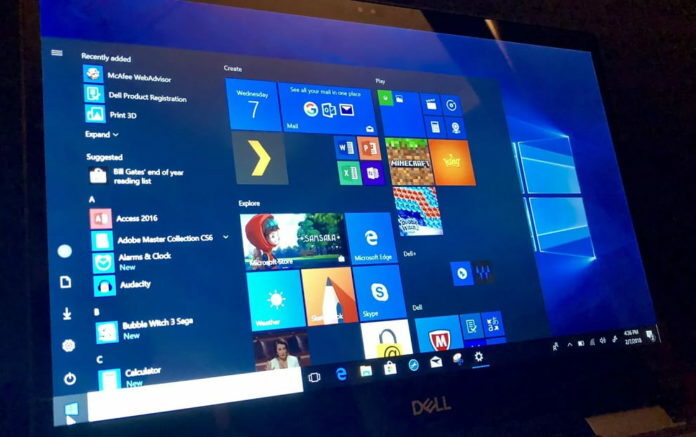 In Windows 10 operating system, Microsoft is offering users the power to customize the Start menu, the users can choose between the two designs, and even resize it. Microsoft is still making changes to the Start menu and with every new version of Windows 10, the Start menu is also updated with new changes. 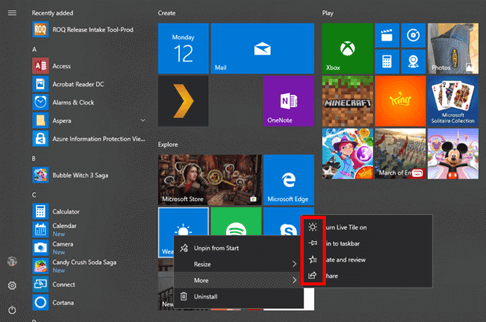 Microsoft’s Jen Gentleman, Eric Papamarcos, and Rick Duncan of the Windows CoreUX team in a blog post explained how the feedback from the Windows Insiders helped the software giant craft the look of the Start menu. Microsoft introduced Start menu with Windows 95 and ever since then, the Start menu has received improvements and refinements. The Start menu has become one of the most iconic parts of the Windows experience. Microsoft realised the importance of feedback after the controversial redesign in Windows 8 which replaced the links with live tiles and also ditched the start button. Microsoft realised the mistake and revamped the Start menu experience in Windows 10. The design of the new Start menu makes it easy to access files across platforms and the company has been improving the Start menu with every new release of Windows 10. “With the next version of Windows after the initial Windows 10 launch (Windows 10 Anniversary Update), we continued to refine Start with a cleaner design that reduced the amount of clicking and scrolling needed to launch apps,” Microsoft said. In the Windows 10 Anniversary Update, Microsoft moved the All Apps list to the top level to make it easier for users to access the apps. Microsoft also combined the “Most used” and “All apps” into one. 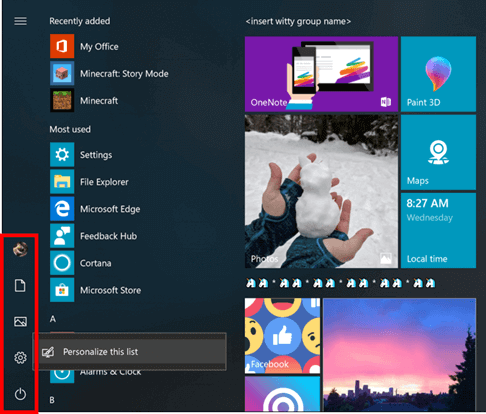 As Microsoft is always looking for feedback, the company posted a quest “What do you think of our new Start menu design?” in the Feedback Hub. The feedback was strongly positive. After reviewing the feedback, Microsoft made more changes to the Start menu. The company moved the recently installed apps section above the “Most used” and added the option to hide All apps list. 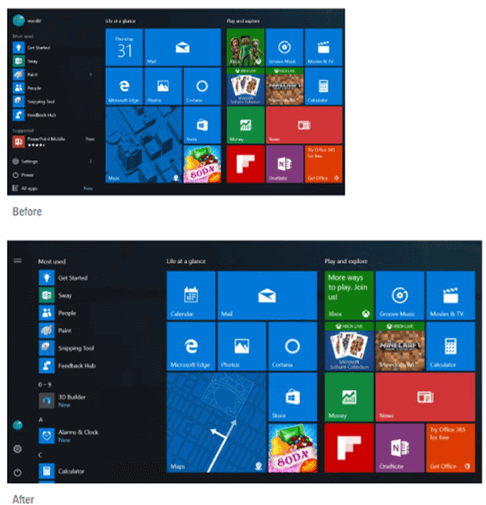 Microsoft also added tile folders support to help users organize Start Tiles in a much better way. With the release of Windows 10 Creators Update and Fall Creators Update, Microsoft introduced Fluent Design’s acrylic material to the Start menu and crafted a smooth resize experience. The company also added new icons to the context menu to improve the overall look of the new Start menu. With the next version of Windows 10, Microsoft is adding support for Simplified letter grouping in Start for East Asian languages. Microsoft is also enabling new Reveal effect in Start in All apps list, this shows the important elements when your mouse hovers over them. In response to the feedback, Microsoft added Documents and Pictures folders link to the Start menu. “If you’d like to customize the folders that appear here, just right click an item and there’s now a link directly to the customization settings,” the company explains. Windows 10 Spring Creators Update is projected to begin rolling out on April 10 in stages. The story of Start menu updates doesn’t end here. Microsoft has planned new changes for the Start menu in future releases of Windows. What do you think about the Start menu in Windows 10? Let us know in the comments below.